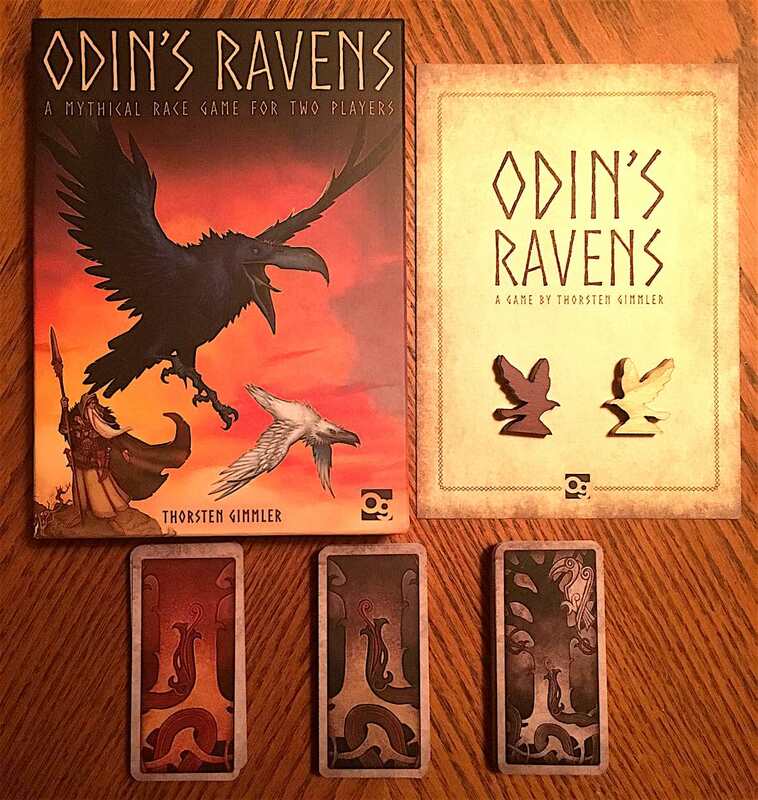 Odin’s Ravens is played out on a racing track of land cards. Each card depicts two different land types (mountains, forests, plains, desert, frozen northlands). Each raven starts on one of the two land tracks depicted on the two-part cards and races through all of the domains to arrive back at the beginning. Players have a deck of cards depicting the five different domains and must show a matching card from their hand that depicts the next land type they want to move onto. If the active player does not have a matching card, s/he can play two cards of the same land type instead and still move forward. If the player totally gets stuck, she can spend a Loki card (if she has one) from her hand. Each Loki card shows two available options for monkeying with the land track to make it work for you or make it harder for that clearly inferior other raven to make it back to Odin. The first raven who flies over all of the land and returns to Odin’s arm first is clearly the superior raven. Osprey Publishing has recently been venturing into the realm of board, card, and role-playing games with some very cool and somewhat offbeat offerings. This edition of Odin’s Revenge is a refinement of a game that’s been around since 2002. Besides redoing all of the art and upping the ante on the production values, they’ve also streamlined the rules to make the game faster, less cumbersome, and I suspect, to widen its appeal. This is the perfect kind of game to play with the family, for a quickie, or to play something fun with people who don’t normally game. The fine folks at MTG Manager have one of the favorite apps for fans of the game. Now they are toying around with an AR option that could display information about each card and possibly animate the images. This concept video of what it might look like live is pretty neat!